The NiceHarsh Miner is an application that is created by NiceHarsh and it’s main purpose to simplify mining of bitcoins. 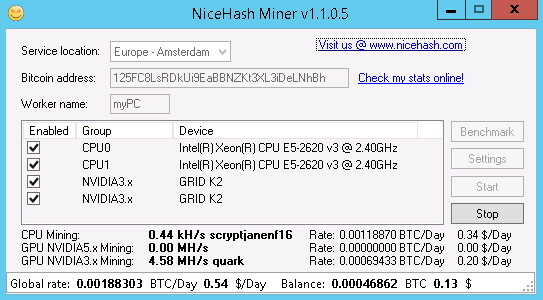 The available NiceHarsh Miner 2 for beginners only works in PC with 64bits windows. This application is seen by windows defender as a malware and to successfully install this application one have to deactivate the windows defender else this application can’t be installed. For every miner to earn more from bitcoin, the miner have to spend more time online. So running the Application requires time and also good power supply to keep your system working for reasonable period of time. It is important to note that there might be a mining fee attached to receiving the bitcoin that you mined. Once this automated mining fee has been paid, the three way authentication process will be confirmed and the bitcoin sent to your wallet address. If you are having any issue with Application use the CONTACT US PAGE to reach us or leave your comment below. Don’t forget to subscribe to our newsletter for latest updates from us. Disclaimer: Mntrends will not be held responsible for any loss of BTC in the process above as we neither the creator of the app nor the promoters. We are just a blog that gives insight on possible way to earn BTC.